We were recently contacted by Sweet Smiles who shares office space with Lollipop Pediatric Dentistry, an existing customer of ours. Lollipop Pediatric Dentistry and Sweet Smiles both needed a lobby sign for their Garden Grove, California office. 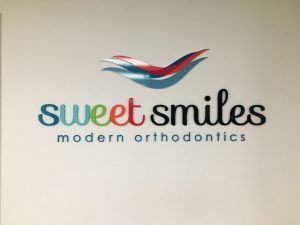 As you can see from the photo, Sweet Smiles emphasizes on their modern methods while being kid friendly with their business name to appeal to children, teens, and their parents. Sweet Smiles is an orthodontist’s office that has been serving Orange County since 1977. Their team of specialists utilizes the latest advances in orthodontic technology and they take pride in their modern orthodontic practice. At Sweet Smiles, you can expect personalized care as they have one doctor and one caring team supporting him. Dr. Ikeda is an award-winning orthodontist and USC School of Dentistry clinical assistant professor. Sweet Smiles also takes the quality of the water they are using very seriously and is one of the only practices in Southern California to employ the highest standards in water testing. They regularly send water samples to a lab for additional testing because their patient’s health is their top priority. Many professional offices will invest in a lobby sign because they have clients at the office on a daily basis. A lobby sign makes a great impression on patients and it’s nice to have something in your lobby and reception area as opposed to blank walls. Dentists and orthodontists that want to appeal to younger patients will often get window or wall graphics to liven up the area. But when it comes to your logo, you want something that will make a greater impact than a flat wall graphic. Dimensional letters and acrylic backer signs make much more of a visual impact. If you’re considering getting an interior sign for your lobby or reception area, give us a call today!